"Pacific Air Command, United States Army" redirects here. For the Pacific Air Command of 1947-1949, see Seventh Air Force. "PACAF's primary mission is to deliver rapid and precise air, space and cyberspace capabilities to protect and defend the United States, its territories and our allies and partners." Hickam Air Force Base, Joint Base Pearl Harbor–Hickam, Hawaii, U.S.
Gen Charles Q. Brown Jr. The beginnings of PACAF can be traced back to June 1944, when Major General St. Clair Streett's Thirteenth Air Force was added to Allied Air Forces, South West Pacific Area. At approximately the same time, Lieutenant General George Kenney created the Far East Air Forces (FEAF) from his Fifth Air Force headquarters, while the Advanced Echelon became the Fifth Air Force under Major General Ennis Whitehead, Sr. The RAAF also formed the Australian First Tactical Air Force under Air Commodore Harry Cobby in October 1944, and when General Douglas MacArthur became commander of all Army forces in the Pacific, the Seventh Air Force was added as well. Far East Air Forces (FEAF) was activated on 3 August 1944, at Brisbane, Queensland, Australia. FEAF (Provisional) had actually been created on 15 June 1944, and Fifth Air Force assigned to it. FEAF was subordinate to the U.S. Army Forces Far East and served as the headquarters of Allied Air Forces Southwest Pacific Area. Primary mission performing allied occupational assistance on the Japanese Home Islands and the Korean peninsula. Coinciding with the establishment of the United States Air Force (USAF) as an independent service in September 1947, PACUSA/FEAF deployments to Korea prior to the 1948 partition of the country helped in the establishment of the Republic of Korea (e.g., South Korea), along with the transfer of surplus military equipment and other aid to French Indochina as well as aid to the Nationalist Chinese during the Chinese Civil War which resumed after the end of World War II (1945–1949). ** The 31st Photo Reconnaissance Squadron was a Strategic Air Command unit, attached to FEAF for operations. On 29 June 1950, the unit began flying combat missions over the Korean Peninsula in their RB-29 Superfortresses to provide FEAF Bomber Command with target and bomb-damage assessment photography. In response to the threat posed by the introduction of Soviet-built (and often Soviet-manned) MiG-15 jet fighters into the Korean People's Air Force (KPAF), USAF F-80 and F-82 units were later re-equipped with the North American F-86 Sabre jet fighter between December 1951 and Spring 1953. Eventually, these USAF F-86 units would establish a kill ratio of 10:1 versus their KPAF adversaries. During the Korean War (1950–1953), alongside the U.S. Navy and small allied contingents, FEAF's Fifth Air Force bore the brunt of the coalition air combat operations. On 1 July 1954, Pacific Air Force was activated at Hickam Air Force Base, Territory of Hawaii, and assigned to Far East Air Forces (FEAF), which was headquartered in Japan. Pacific Air Force at Hickam functioned primarily as the Air Force staff component and planning element of U.S. Pacific Command. 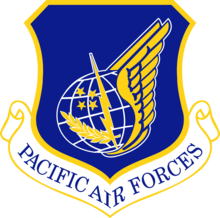 On 1 July 1956, Pacific Air Force was redesignated Pacific Air Force/FEAF (Rear). Headquarters FEAF began preparations to move from Japan to Hawaii. Smith assumed additional responsibilities as deputy commander, Far East Air Forces. This was followed on 1 July 1957 with United States Far East Air Forces being redesignated as Pacific Air Forces (PACAF) and transferring its headquarters to Hickam AFB, Territory of Hawaii. Tensions between the Communist Chinese on the mainland and the Nationalist Chinese on Taiwan dominated FEAF and PACAF during the mid and late 1950s. The 1954 and 1958 Taiwan Strait Crisis both threatened to break out into a war, and USAF F-104C fighter squadrons were deployed to Kung Kuan Air Base on Taiwan in 1958. The question of "Matsu and Quemoy" became an issue in the 1960 American Presidential election when Richard Nixon accused John F. Kennedy of being unwilling to commit to using nuclear weapons if the People's Republic of China invaded the Nationalist outposts. In response to what has become known as the Gulf of Tonkin incident in 1964, Tactical Air Command (TAC) pilots, navigators and support personnel found themselves deployed from the CONUS to PACAF bases such as Da Nang Air Base and Phan Rang AB in South Vietnam. Takhli Royal Thai Air Force Base and Korat Royal Thai Air Force Base in Thailand were also used by deployed TAC fighter squadrons. By 1970, direct PACAF involvement the war was winding down as the conflict was being increasingly turned over to the South Vietnamese under the process known as Vietnamization. Units from the Republic of Vietnam Air Force (VNAF) took on more and more combat to defend their nation while PACAF tactical air strength was being reduced as several air bases were turned over to the VNAF. Combat aircraft of PACAF flew their last strikes in Cambodia 15 August 1973, writing the final chapter to the long and costly history of active American participation in the Indochina War. The Paris Peace Accords of 1973 ended PACAF's use of South Vietnamese bases, and by 1976 bases in Thailand were turned over to the Thai government. In 1979, normalization of relations with the People's Republic of China also led to the withdrawal of PACAF personnel from Ching Chuan Kang Air Base, Republic of China (Taiwan). ^ Griffith 1998, pp. 174–175. ^ Stephens 2001, pp. 168–170. ^ Kenney 1949, pp. 537–538. ^ The United States Far East Air Forces was a separate command from the World War II Far East Air Force (United States) (28 October 1941 – 5 February 1942) which fought in the Philippine and Dutch East India campaigns. Initially it was composed mostly of aircraft and personnel from the Philippine Army Air Corps. It was largely destroyed during the Battle of the Philippines (1941–42) and the surviving personnel and aircraft were later reorganized in Australia as the U.S. Fifth Air Force. ^ American Caesar, Douglas MacArthur 1880–1964, William Manchester, Little, Brown, 1978. ^ a b Futrell, Robert F. with the assistance of Blumenson, Martin (1991) The United States Air Force in Southeast Asia: The Advisory Years to 1965, Office Of Air Force History, United States Air Forceriority in Korea. Annapolis: U.S. Naval Institute Press, 2005. ISBN 1-59114-933-9. ^ Glasser, Jeffrey D. (1998). The Secret Vietnam War: The United States Air Force in Thailand, 1961–1975. McFarland & Company. ISBN 0-7864-0084-6. ^ Kelman, Brett. "AF seeks backup runway in western Pacific." Pacific Daily News, 11 October 2011.